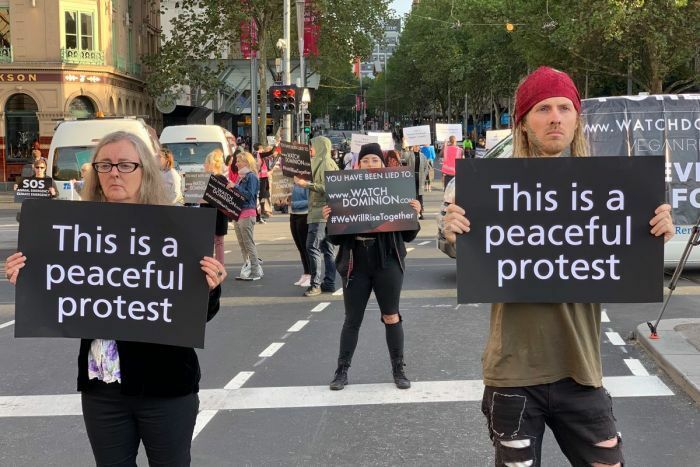 Animal rights activists have launched protests across the country, with a group of people disrupting traffic in Melbourne’s Flinders Street and blocking tram routes. Early this morning, about 20 people had chained themselves to equipment at an abattoir west of Brisbane and had infiltrated a Goulburn abattoir in New South Wales, and another in Laverton in Melbourne. 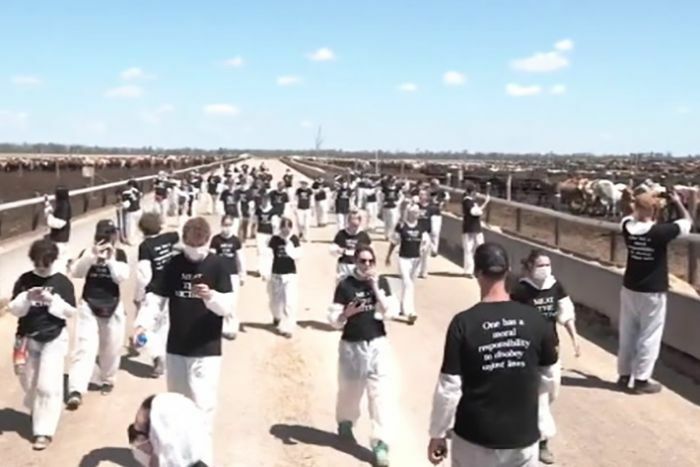 The protests have been organised to mark the one-year anniversary of the release of the documentary Dominion, which looks into practices employed daily on Australian livestock farms. Police officers were on scene at both the Queensland and New South Wales abattoirs, with Goulburn police arresting nine protestors and currently in the process of charging them with trespass. The Queensland Government yesterday announced that animal activists who invaded farms would face on-the-spot fines, under tough new regulations to combat any future risks to biosecurity. Agriculture Minister Mark Furner said the penalties would be “severe” and “to the maximum” available, but was unable to give a figure. Animal activists who trespass on Queensland farms can already face penalties of up to a year’s imprisonment. Agriculture Minister Mark Furner said it was a “matter of urgency”, but stopped short of giving an amount for the fines and a timeframe of when they’d be introduced. “I’ve had a gutful of this behaviour,” he said. “This will provide a greater access for people to be issued with on-the-spot fines for illegal activities, trespassing and breaching biosecurity on our farms properties. A joint taskforce will also be set up between Queensland Police Service’s intelligence unit and the Department of Agriculture and Fisheries to gather information around animal activism. “A lot of these unlawful, disruptive protests are being planned on social media, so putting the additional resources into that intelligence gathering will ensure that we’ve got the right people in the right place at the right time,” Police Minister Mark Ryan said. Mr Ryan said people could protest lawfully and peacefully, but it was unacceptable to invade a farm. “If you do so lawfully and peacefully, you won’t get in trouble. But as soon as you cross the line, our police will be there and expect the full force of the law,” he said. He said he had been told police officers were monitoring plans for further protests and “appropriate resources” were in place. Deputy Opposition Leader Tim Mander welcomed the announcement but said it was not strong enough. “It’s long overdue and we’re worried that it’s not heavy enough,” he said.